DJI recently launched what seems to be a massive agriculture drone in China. It is called the T16 and the video below explains everything in great detail to anybody who can understand Chinese. Unfortunately, that does not include me. However, there are a few things that become clear as you watch the video. Apparently, DJI launched a new agricultural drone in China recently. The video of which you can see below. It is hard to get all the details from it as it is all in Chinese. I tried taking screenshots, OCR them and then use Google translate but no luck there. So, if you happen to speak Chinese, feel free to chime in. Our friends from DroneWatch in The Netherlands have been able to get a lot more information on the new T16 agriculture drone from DJI. The T16 has a 16 liters (4.23 gallons) container on board for ‘plant protection fluids. Integrated ground radar allows the drone to closely follow the terrain. The addition of AI in combination with a 3D point cloud enables the drone to recognize trees and deliver a high-precision application. More stringent rules and regulation in Western European countries, the US and Canada may be the reason why the DJI T16 will only be available in China for now. When folded up the size of the DJI T16 will be reduced by 75% for easier transportation. IP67 rating protects against rain and dust. Both the tank reservoir and the batteries can be swapped easily and quickly. The batteries have a capacity of 17.500 mAh. The charger has a capacity of 2600W and can charge four batteries at once. One battery can be charged within 20 minutes with a special fast-charging option. The integrated spray system has four motors, eight spray heads. A maximum spray capacity of 4.8 liters (1.27 gallons) per minute. The drone can spray up to 6.5 meters (21.33 feet) wide. In combination with the Phantom 4 RTK, one could create a highly precise 3D map of the area that is to be sprayed. AI can then be used to calculate and plan the optimal flight path for the DJI T16. The DJI T16 has obstacle avoidance front and back. The integrated ground radar allows for very precise altitude determination even in dusty or foggy conditions. The DJI T16 can even be used at night as it is equipped with a floodlight. The T16 plant protection unmanned aircraft has reshaped the overall structure and adopts a modular design, which brings the high load and wide spray width of the Dajiang Plant Protection Unmanned Aircraft as never before. Powerful hardware collaboration AI intelligent engine technology and 3D job planning capabilities bring plant protection operations to new heights. A few other things do become clear after watching the video. The T16 drone has six rotors, mounted on foldable arms. It can spray up to 4.8 liters of plant protection, i.e. pesticides per minute. The drone has a waterproof rating of IP67 meaning you can fly it in the rain. 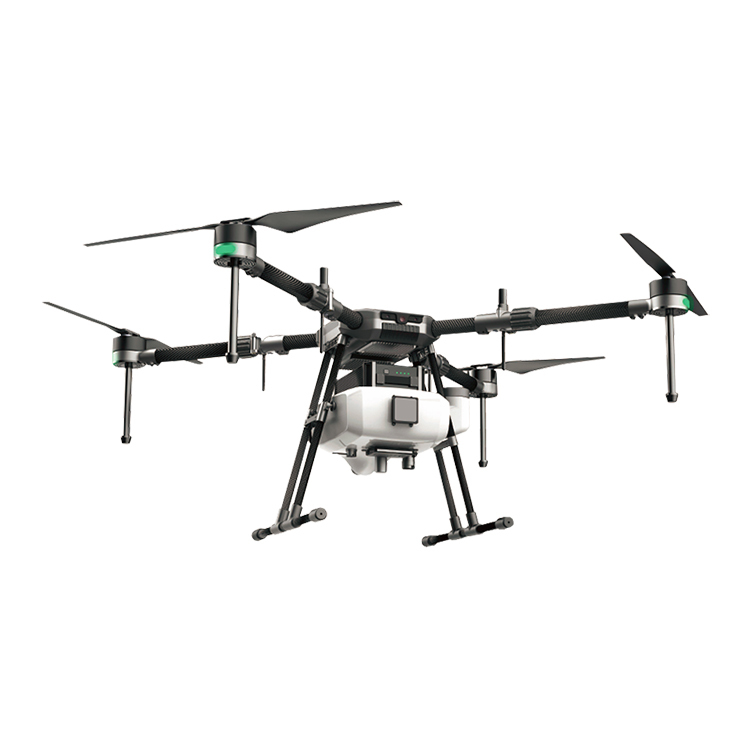 The DJI T16 drone also has obstacle avoidance and features RTK for highly precise spraying and land or crop monitoring. The drone also comes with what seems to be quite sophisticated software to plan the flight of the drone and make accurate maps of the area. It also seems to have some kind of radar system mounted below the drone that allows the drone only to spray when it is actually flying over the treetops and not in between the trees. Obviously, this would go a long way in using less ‘plant protection’ per acre. It seems that the DJI T16 offers the latest in high precision application of ‘plant protection’ by drone, from DJI. About one year ago, DJI Launched the MG-1S Advanced and the MG-1P drones for the agriculture market. Alternative solutions are offered by Yamaha with the YMR-08 drone for instance.